In searching for the ideal location for its half marathon, the MCM Organization sought a welcoming community boasting history and hospitality. Around 50 miles south of DC, just 20 minutes from Quantico and a little more than an hour from Richmond, Fredericksburg, VA serves as the host for the Historic Half. 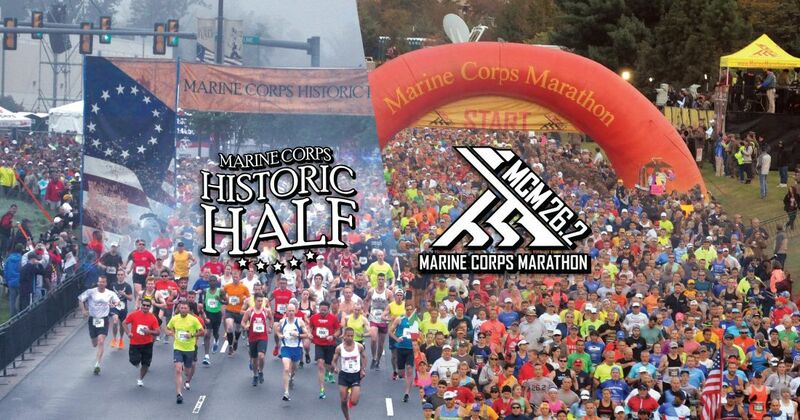 The Marine Corps Historic Half offers runners the pageantry, scenery, history and activity that is expected at the Marine Corps Marathon, only at half the distance. 1-Historic Landmarks: The MCM course features the nation’s most recognizable landmarks including the National Mall, the Pentagon and Marine Corps War Memorial. From the Revolutionary War to the Civil War, Fredericksburg has witnessed multiple battles and boasts compelling African-American and civilian Civil War stories. The first president grew up in the Fredericksburg area and visitors can visit his boyhood home at Ferry Farm, as well as his mother’s home, monument, and final resting place, in Downtown Fredericksburg. The Historic Half course passes many of these locations with others worth touring throughout an event weekend visit. 2-Famous Uphill: The Mile 26 sign at the MCM is situated on Marshall Drive adjacent to Arlington National Cemetery right before a steep elevation climb for the final .2 of the course. Not to be outdone, the Historic Half has its own vertical challenge: Hospital Hill, a 0.53-mile segment of the 13.1-mile course. Runners arrive at Mary Washington Healthcare campus at mile 10.5. Hospital Hill is in the middle of a two-mile uphill climb that peaks at Cowan Boulevard crossing over Interstate 95. The much-talked-about Hospital Hill stretches over 930 yards in which the hill’s elevation doubles from 100 feet to 200 feet, or the equivalent of climbing to the top of a ten story building. 3-Ceremony: Both, the MCM and Historic Half, start with the blast of the howitzer following the presentation of the colors by the ceremonial platoon, the singing of the anthem and an inspiring flyover. The Half even adds to the pageantry with a town crier bellowing the start command to a period reenactor who fires a musket in concert with the howitzer. 4-Spectators: The MCM runs through residential areas in Rosslyn, Georgetown and Crystal City. Along the course, more than 100,000 spectators cheer and encourage the runners. At the Historic Half, much of the course roles right outside the homes of residents and through the picturesque downtown. The local community cheers runners from front porches and sidewalks with enthusiasm and spirit. 5-Two-day Expo: The MCM Health & Fitness Expo is held the Friday and Saturday before “The People’s Marathon” at the Gaylord National Resort in National Harbor. The Historic Half Healthy Lifestyle Expo at the Fredericksburg Expo and Conference Center happens on the Friday and Saturday leading up to the Historic Half. Held on Friday, May 15 and Saturday, May 16, the Half’s Expo boasts more than 60 vendors, booths, activations and sampling locations, in addition to Packet Pick-up. 6-Host Community: Shopping, restaurants, sightseeing, attractions, selfie-worthy locations. Check the box on all those in Arlington/nation’s capital for the MCM and certainly Fredericksburg for the Half. The Fredericksburg, VA, region’s culinary scene is quickly gaining notoriety among state and national food authorities. Within the counties of Stafford and Spotsylvania and the city of Fredericksburg, you’ll find an array of independent and chef-owned restaurants in the most unique and quaint settings. 7-Distance Options: Both event dates feature multiple distance options. At the MCM, runners may also choose to run 6.2 miles in the MCM10K or the now sold-out MCM50K. Registration for the 10K opens on April 24. During Historic Half Weekend, additional event options include the Semper 5ive and the Devil Dog Double, a combination of the 5ive and the Half for a total of 18.1 miles, resulting in three earned medals. Registration for all Historic Half Weekend events is now open. 8-Marines: Both events feature the incredible support and motivating presence of the United States Marine Corps . Runners will encounter Marines along both courses working at water points, security screening and food stations, distributing finisher medals and many other essential operational roles. The MCM and Historic Half also feature the outstanding Navy medical teams at all aid stations. The distance of 13.1 miles isn’t what most runners focus on when considering the Historic Half. For some, it’s the distance to the previously unknown city of Fredericksburg. Yet after making the journey, runners and their families are thrilled to have discovered a true gem of a community just off I95. Spring weather is here and with it arrives the desire to get out and explore. Make Fredericksburg and the Historic Half the weekend getaway destination for these reasons and others that you’ll discover. Register now to #RunWithTheMarines in May. The Fredericksburg area, which includes the city of Fredericksburg and the counties of Spotsylvania and Stafford, is a classic blend of modern life with small town charm. Conveniently located along I-95, between Washington and Richmond, the area features a variety of chef-owned restaurants, numerous art galleries, a wide range of specialty shops, and one of America’s most authentic, historic downtowns. Stafford is home to George Washington’s boyhood home, Ferry Farm and Belmont, the residence of 20th Century American impressionist painter Gari Melchers. Spotsylvania is not only the site of 4,400 acres of Civil War battlefields; it also boasts the beautiful Lake Anna Winery. The Fredericksburg Area rests on the banks of the picturesque, pristine Rappahannock River.